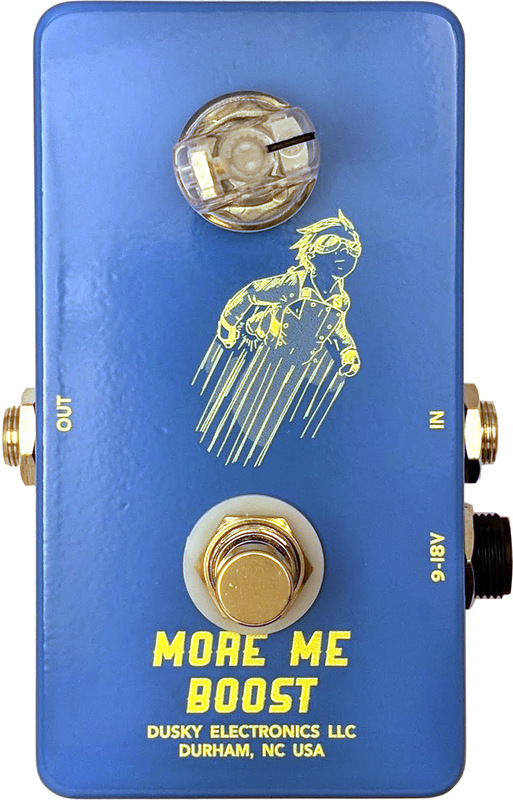 The More Me is a boutique clean boost designed to behave as another gain stage in front of your tube amplifier. Subtle non-linearities in the single MOSFET gain stage add a touch of harmonic distortion without clipping, adding some character that you wouldn't get with a squeaky clean op-amp based boost. A gentle rolloff of extreme lows and extreme highs focuses the sound more on the midrange frequencies, giving a more focused overdriven sound when used to push the front end of a tube amp into overdrive. Twenty dB of clean gain insure you can pummel any tube amp into roaring overdrive—or back it off to kick in just a little "more me." A single glowing volume knob is the only control you really need.